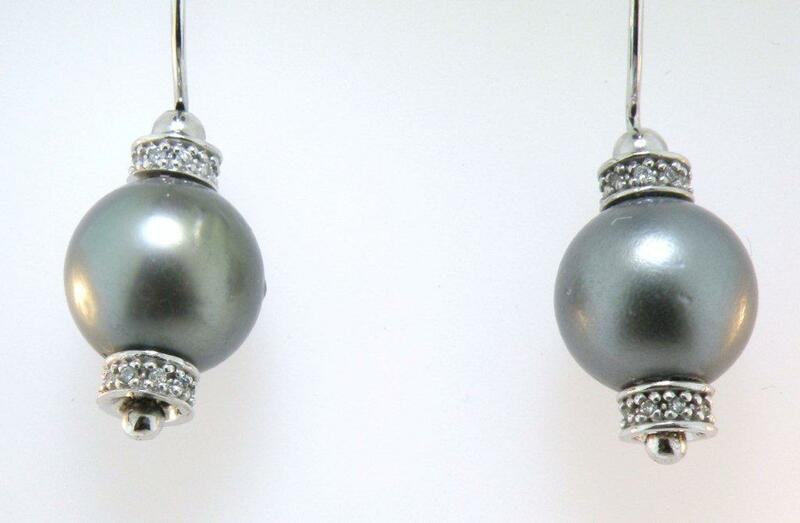 These pearls are a lovely natural color silvery dark gray. They graduate from approximately 10mm diameter to 12.5 mm diameter. The necklace is 18½ inches in length and has a bow shaped 14 karat white gold clasp which is set with .16 carats of diamonds. 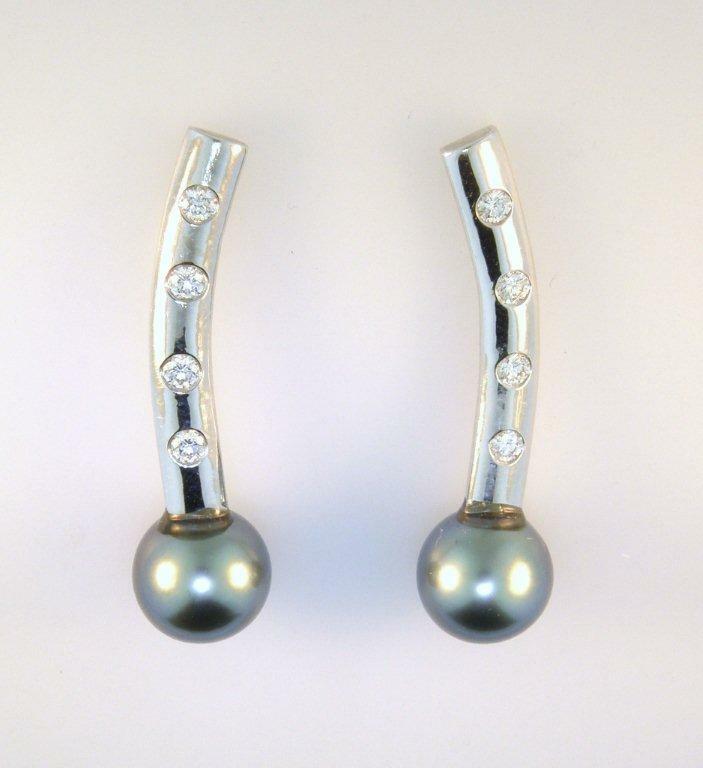 These earrings are a perfect match for the Tahitian Pearl necklace, in the same silvery dark gray color. They are suspended from 14 karat white gold hand forged ear wires and have diamond roundels containing .12 carats of diamonds. The earrings are approximately 1 ½ inches long, with the pearls approximately 10.5 mm in diameter. Simple yet very elegant! 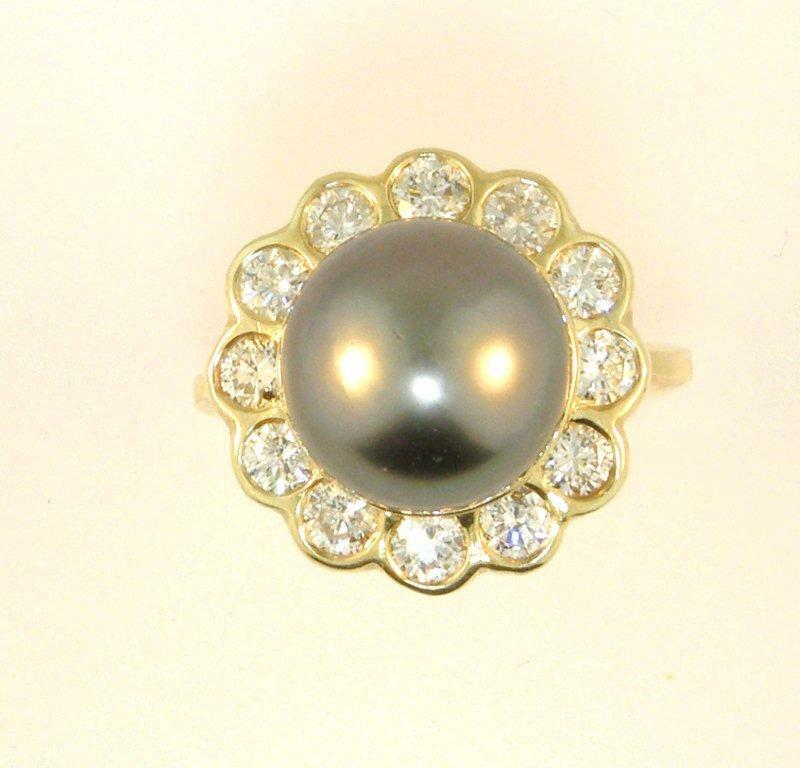 A deep black Tahitian pearl of 11.5 mm diameter is surrounded by 12 round brilliant diamonds totaling 1.44 carats. This ring was hand carved, cast and hand set in 14 karat yellow gold. Size 6.5. These earrings were hand forged fabricated from 14 karat white gold. The white gold curves are burnished with 4 diamonds each for a total diamond weight of .32 carats. 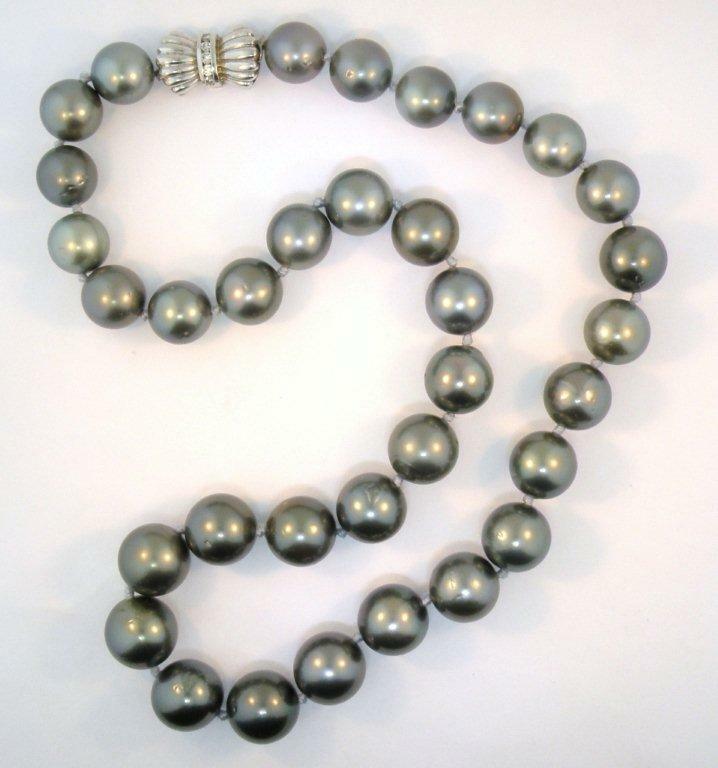 The deep black pearls are 9mm in diameter. These elegant post earrings are approximately 1 5/8 inches long. This 14 karat yellow gold ring was completely hand fabricated, forged and torch sculpted. 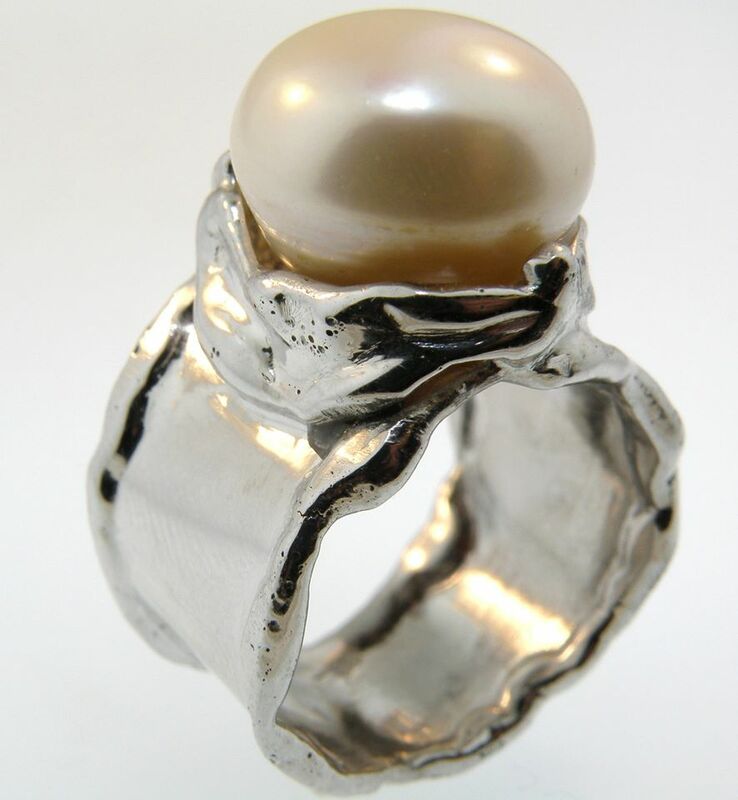 The centerpiece of the ring is a 15mm semi-round shaped pure white South Sea Pearl. The ring tapers from 17mm at the top to 8 mm at the shank. Size 8. The set features white drop shaped South Sea pearls of 10mm diameter in the earrings and 11.5 mm diameter in the pendant. 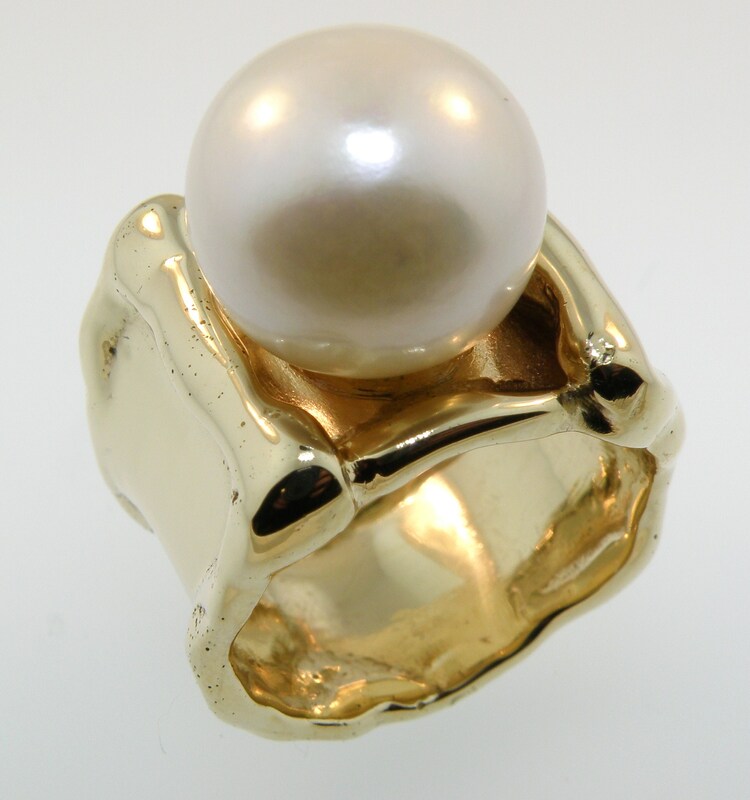 The pearls are suspended from hand forged and torch sculpted 14 karat gold and are set with a total of .50 carats of diamonds. The earrings are 1 1/8 inches long and the pendant is 1 7/8 inches long, with a substantial bail that will accommodate up to a 3 mm diameter chain or a 4mm omega. 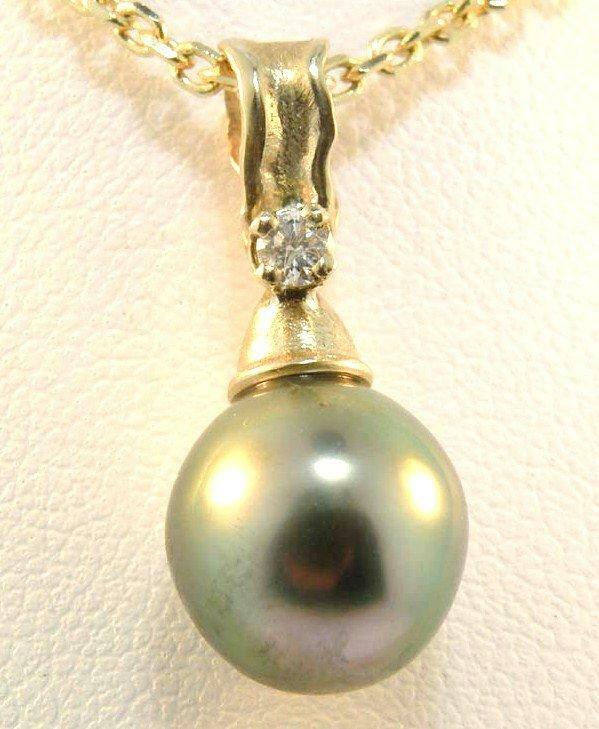 This simple pendant features a round Tahitian pearl of 10 mm diameter suspended from a 14 karat yellow gold hand forged and torch sculpted bail, accented by a single diamond of approximately .06 carats. It is approximately 7/8 inches long. 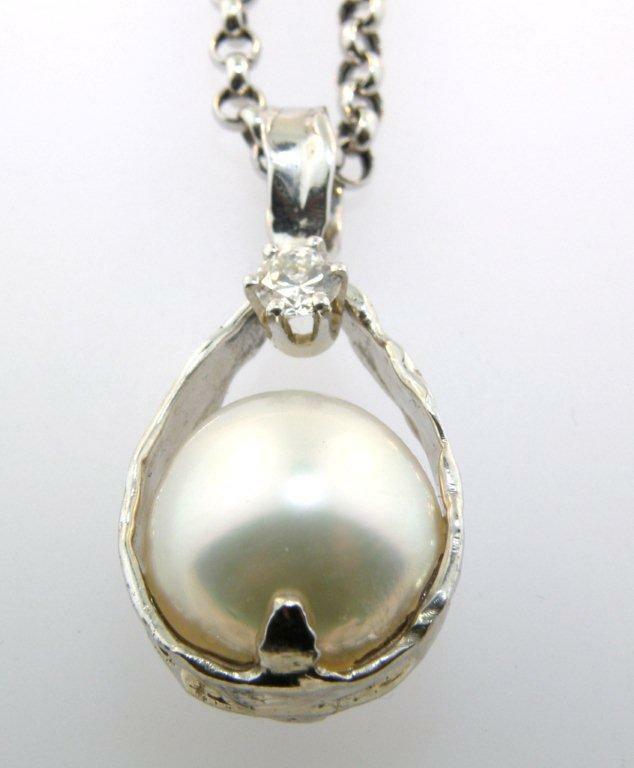 Cradled in hand forged and torch sculpted 14 karat white gold, this pendant features a round white South Sea Pearl of approximately 12.5 mm diameter. It is accented at the bail with a single .20 carat diamond. The pendant measures approximately 1-1/8 inches long. 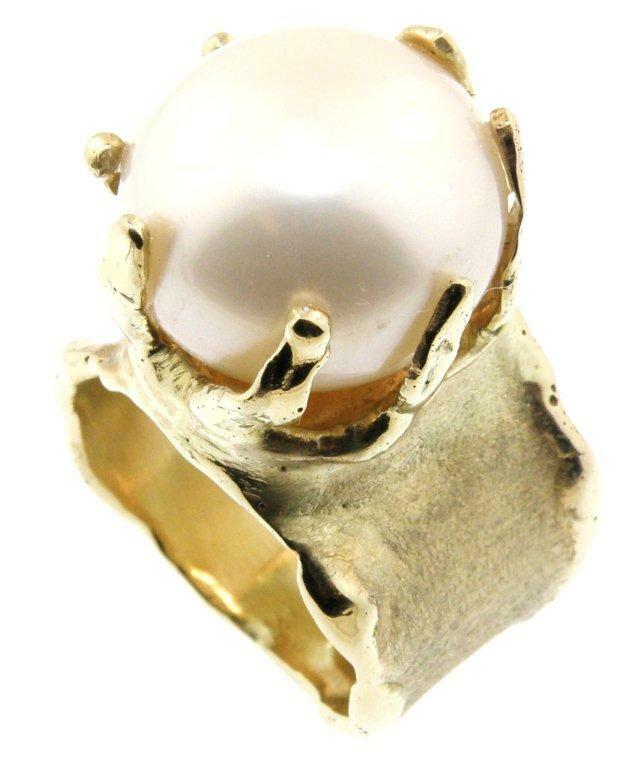 This semi-round lustrous creamy white freshwater pearl is set in between two waves of 14 Karat yellow gold. The pearl measures 13 mm in diameter, and the ring tapers to 12 mm in the back. Size 8. 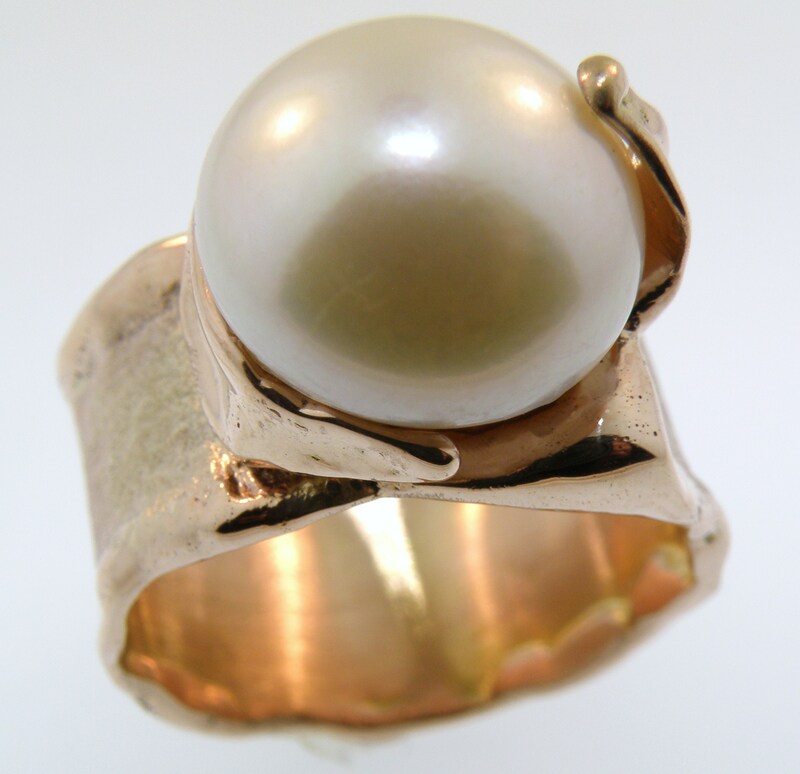 This asymmetrical ring features a white button shaped freshwater pearl, 12.5 mm in diameter, accented with a wave of rose gold on one side and held in place with a rose gold prong. The ring has a brushed finish, and tapers to 11 mm in the back. Size 7 ¾.